From meal caps to airport shuttles to airfare, accurately capturing spend on healthcare professionals remains one of life sciences planners’ biggest challenges. Get a bunch of meeting planners in a room, and the conversation quickly gets down to the nitty-gritty details. Get a bunch of life sciences meeting professionals in a room, and that conversation goes to a whole new level of granularity. While the minutiae may be mind boggling to the uninitiated—does it really matter how you split up the cost among riders on that airport shuttle, or whether you include a bartender fee in the cost of a meal?—it’s essential that planners who live in the pharma and life sciences world have a process for collecting, tracking, and reporting every piece of spend data that comes their way. After all, every transfer of value (TOV) between the company and a healthcare professional must, by law, be accounted for to the penny. Is it any wonder that it’s all about the data for today’s life sciences planners? At this year’s Pharma Forum, held in March at the Gaylord National Harbor in National Harbor, Md., the talk returned again and again to data—how to most accurately track and report TOV data, data on what HCP attendees want and need now, and data on how those HCPs interact with content, each other, and the company. Oh yes, and how to actually use that data to improve meetings—all the while staying in compliance. One of the stickiest wickets for life sciences planners is how to comply with regulations that require them to track HCP spend—and, specifically, what they spend on food and beverage at face-to-face events. The need for life sciences companies to track what they spend on physicians started with the Pharmaceutical Research and Manufacturers of America Code on Interactions with Healthcare Professionals—a voluntary effort to rein in improper TOVs launched in 2002—and now encompasses several state-level laws, the federal Open Payments Act, and similar codes and laws in other countries. Most of these codes and rules just say that F&B spend must be “reasonable” without defining specific dollar figures for meals. As a result, every company has developed its own interpretation of what “reasonable” means. And often that interpretation results in spending limits that make it nearly impossible to keep HCPs “reasonably” nourished and hydrated, especially in more-expensive cities. For the second year, Pharma Forum co-organizers MeetingsNet and CBI surveyed life sciences meeting professionals and their hotelier counterparts to provide a baseline that planners can use to make a case to compliance and legal departments that it’s time to bring meal caps more in line with today’s catering reality. This year, they recruited pharmaceutical benchmarking firm TGaS Advisors to help collect and scrub the data. Forty-one organizations responded: 23 life science company planners and 18 consultants/third parties/vendors. While almost 85 percent of hoteliers report that meal prices increase 1 to 5 percent annually, 70 percent of life sciences clients say meal caps do not increase year over year. Almost three quarters of hotelier respondents have been asked to decrease a meal price to meet a group’s meal cap and make up the difference in another area, such as meeting room rental. Fortunately, only 15 percent say it happens regularly. All agreed that the practice, while legal, is not ethical and should be avoided. Almost 60 percent have never turned down a pharma group because of restrictive meal caps. But the issues around tracking food-and-beverage spend don’t end with meal caps. There’s also the issue of how to handle BEOs and guarantees. For example, how do you account for the per-person spend you need to report when you guarantee F&B for 50, but only 25 people show up? One way to handle low attendance is to divide the total by the original guarantee number and consider the remainder to be your attrition, suggested one pharma planner in a session on compliance. Also, try to be realistic in your contracts—tell the hotel that, while the goal is to get to 250, history says you usually get a final attendance of about 200. And what about chef or bartender fees—are they included in F&B spend reporting? Attendees at a compliance session had mixed opinions. Many exclude these because they are not part of the meal. Others said that as long as the fees pertained to what they spent on HCPs, they had to be accounted for. Every company has its own guidelines. HCPs who opt out of meal service at an event can also be an issue. No TOV is reported for HCPs who opt out—but planners need to be sure they don’t eat. One planner positions someone at each end of the buffet table to ensure that everyone who loads a dish has signed in. Some reserve tables for those who opt out to make it easier to track. Others said that, instead of an opt-out system, they set a reportable amount, usually by dividing the cost by the number of registrants, that HCPs agree to ahead of time. But tracking spend goes well beyond the banquet hall. Transportation, for example, is another important area. Some companies ask their transportation company to invoice individually for each HCP who takes the bus from the airport, while others divide the total cost by the number of HCPs who register to take the shuttle, whether or not they actually show up. And what to do about airfare change fees and pre- and post-stay requests for HCPs, especially those who are attending a life sciences–hosted event in conjunction with a congress? Again, it varies by company. Some will pay for, and report as a TOV, change fees for HCPs who are registered to attend a congress and need to switch flights to also attend a concomitant life sciences event. Others make HCPs pay the difference on their own. Pre- and post-meeting extensions also can be an issue because it can look to compliance as though the company is paying for that HCP’s vacation, even if there’s no increase in airfare. In other words, this isn’t getting less complicated even though HCPs and companies are becoming accustomed to tracking and reporting meeting spend. 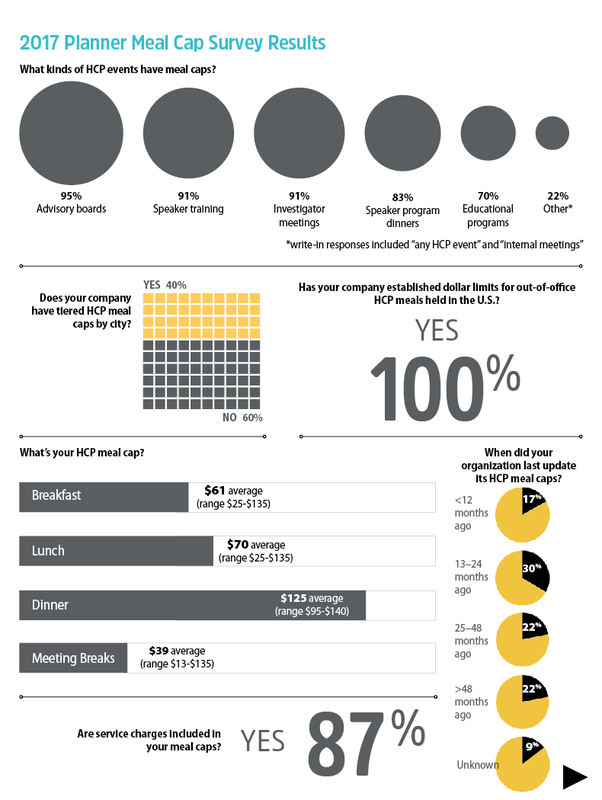 As it was in the beginning, so it remains: Each company’s legal and compliance departments continue to set the comfort-level threshold on HCP spend in every aspect of meetings. The best way to remain compliant, most planners at the Pharma Forum agreed, is to have a policy laying out your company’s rules, a process to ensure those rules are followed, and procedures in place to handle infractions when they occur. Of course, if the meeting isn’t effective, all that spend you’re tracking is going to waste. That’s why Ashfield Meetings and Events last year commissioned a study to determine the role of meetings in the healthcare professional’s learning journey. The research revealed that for 87 percent of HCPs, face-to-face meetings are a critical channel for learning new medical information, second only to professional journals and publications, which were cited by 92 percent as playing a regular role in their continuing education. But there is a lot of room for improvement, noted David Kerr, Ashfield’s senior director, creative and production services, who presented the findings during a keynote presentation at Pharma Forum. While 95 percent of the 237 physicians surveyed across 11 global markets and seven therapeutic areas said they expected that the meetings they attend would be engaging and impactful, 39 percent said that they didn’t have a positive experience at the meetings they had attended recently. And, while 75 percent said they would like to have more input into the meetings they attend, more than a third said they had never been asked for their input. The key to improving meetings is to involve HCPs pre-, during, and post-meeting via the app or an online portal, and then pay as much attention to the data generated through those interactions as you would to HCP spend. The data is there—but it’s up to the meeting planner to actually collect it, analyze it, and use it to shape future meetings that are more engaging and speak more directly to what HCPs want and need to learn. “As an industry, one thing we don’t do well is look at [attendee] data,” said Kerr.